Globe-trotting artist Bodo Molitor may have been born in Germany, but he’ll forever be associated with the psychedelic scene in Mexico and South America. In addition to creating the zoomorphic art for his own bizarre album, “Hits Internacionales,” he also created the psychedelic art for the legendary Kaleidoscope album, for La Libre Expresion, and for his brother Reinhold’s solo album. He had this to say about the Reinhold record: “My Brother Reinhold came for a visit from Germany where he was playing with several bands. He was only 19. I knew Edghar Zamudio (from Peru) and one day he asked us to record that LP. Just acoustic—guitars and a banjo played brilliantly by my brother. I think we recorded the whole album in three or four days. I played some guitars and did some vocals as well. It’s folky and bluesy with originals some covers and traditionals. 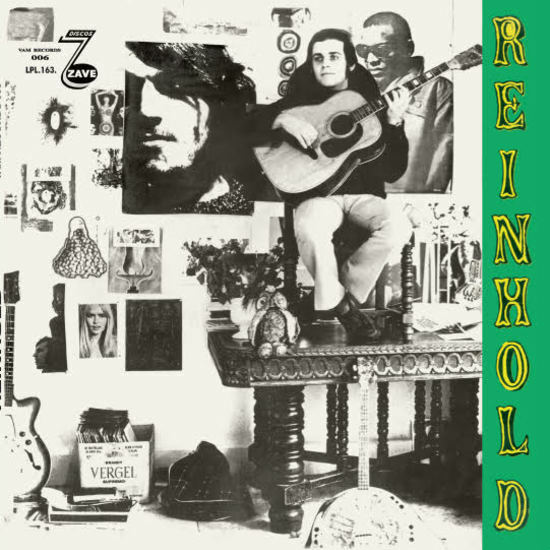 My brother sings and plays guitar and banjo, on some of the songs he wrote.” The Reinhold album is so rare, even with the connection to his more famous artist brother, no one seems to have discovered it… until now. Despite being from the end of the 1960’s, Reinhold has more of an early-60’s NYC Greenwich Village Cafe Wha?-ish folk underpinning. The best tracks have gravel-pated vocals in a vaguely Tom Waits or maybe Joseph Spence sort of vein—really syrupy and quite excellent. Overall, a dark and morose vibe dominates; and we can all use some minor key laments, now and then, right? Limited editions (both formats) of only 500 copies, and available exclusively via Lion Productions and our friends.